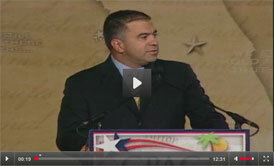 Citizen United president David Bossie is questioning former President Barack Obama’s knowledge in regards to spying on the presidential campaign. Can business-friendly Terry McAuliffe sell himself to leftward leaning Democrats in 2020? Paid for by Citizens United Political Victory Fund and not authorized by any candidate or candidate's committee. Federal law prohibits CUPVF from soliciting donations from sources other than its members and executive or administrative personnel and their families. Contributions received from other sources will be returned to the donor. Contributions to CUPVF are not tax deductible as charitable contributions for federal income tax purposes.